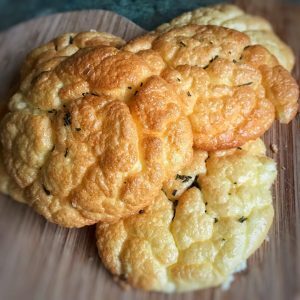 There are two key things to know/do when you are making cloud bread. 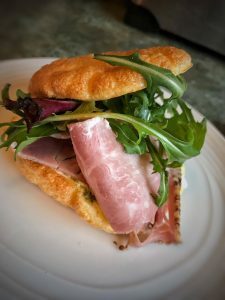 One – it isn’t really the texture of bread, its more like a little set omelette but you can use it in the same way as you would bread (i.e for soup dipping or sarnies). Two – you need to make sure the egg whites are whipped until nice and stiff so the mixture retains its volume when you put it on the baking tray (so it will puff up when its cooking). Once you’ve cracked it, this is a lovely tasty little option that goes with a whole host of things. You can tweak the ingredients depending on what you intend on having it with but the below recipe is the basic one I use most of the time. Today I had two little sandwiches filled with a few slices of ham (1sp), a swirl of pesto (no more than 1/4 tsp 0sp), a tbsp of light cream cheese (1sp) and a few salad leaves. A lovely filling lunch for only 2sp. Take one large bowl and one small bowl. Separate the whites from the yolks of the eggs putting the whites in the large bowl and yolks in the smaller bowl. Whip the yolks with the cream cheese, garlic salt and onion powder until smooth and pop to one side. Add the baking powder to the egg whites and then whisk until the mixture forms stiff peaks. Gently and gradually fold the egg whites into the egg yolks being careful not to lose the air in the egg white (you will need to work quite quickly) and then spoon into 6 round on the baking paper. Bake in the oven for 25-30 minutes until the cloud bread has risen and is lightly browned. Sprinkle the rosemary on top and leave to cool. Serve as you like and enjoy! Sounds good, will have to give it a try. I make a thin omelette and use it instead of a wrap, very filling and high in protein and low in carbs. 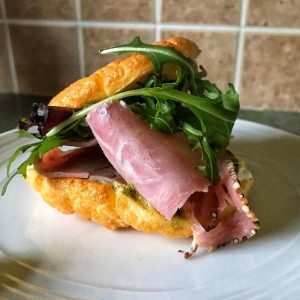 I was too Amy, it’s not something that you could toast but it’s definitely nice for dipping in soup or making a quick savoury sandwich with 😊 hope you like it! Looking at giving these ago. However, i am curious as to why you use baking power and not cream of tartar, as other recipes suggest? Hi Laura! Will try to make them over the weekend… Can I freeze them? Thanks!